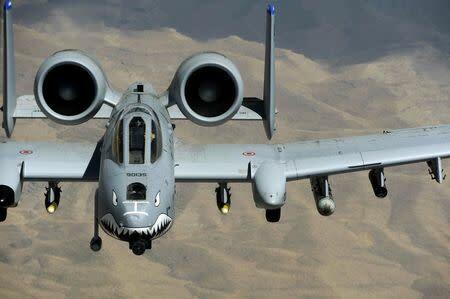 WASHINGTON (Reuters) - An influential group of U.S. lawmakers, including John McCain, in line to become the head of the Senate's powerful Armed Services Committee, on Thursday pledged to thwart the Pentagon's plans to retire the U.S. fleet of A-10 "Warthog" aircraft. The Pentagon, facing mandatory "sequestration" budget cuts, has sought to eliminate all of the tank-killer jets, saying it would save $3.7 billion over the next five years plus another $500 million in planned aircraft upgrades. But many lawmakers have resisted that plan, including Republican Senators McCain of Arizona and Senator Kelly Ayotte of New Hampshire. The 40-year-old, slow-flying Warthog is enormously popular among soldiers and Marines. The heavily armored aircraft can withstand ground fire while loitering for long periods above a battlefield spraying 30mm armor-piercing, depleted-uranium cannon rounds at tanks and other targets. McCain and Ayotte were among about 10 senators and members of the House of Representatives, mostly Republicans, at a news conference with veterans who have experience with the aircraft to pledge to preserve the program. "This fight is far from over," McCain said, slamming "the Air Force's misguided priorities" in seeking to scrap the Warthog and focus on priorities for the future, such as the radar-evading F-35 Joint Strike Fighter made by Lockheed Martin Corp. The effort to retire the Warthog is expected to become more difficult next year, when the new Congress, with Republican control of the Senate and a larger Republican majority in the House, is seated. Defense News reported that the Pentagon has offered a plan to retire only three A-10 Warthog squadrons instead of the whole fleet, but the A-10's backers said they disagree with that plan. 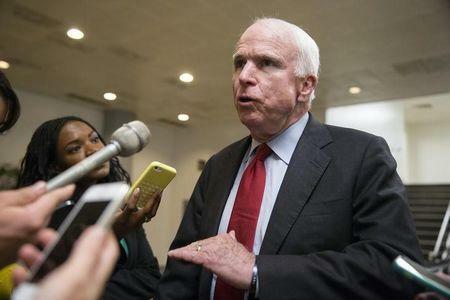 "I'll tell you who would love to retire the A-10s. That's the enemies of this nation," Republican Senator Lindsey Graham of South Carolina said.